Welcome back for the final bathroom design reveal. Today we’re discussing my kids’ bathroom. If this is your first time with us, I have shared previous designs for our new house here, here, and here. I don’t have a floor plan for you to view in this blog post. It exists, but I’m leaving out the rest of the house plan (especially as it pertains to my children) for privacy reasons. It’s a rectangular shaped room. When you walk in, the vanity and toilet are on the right, and the shower/tub combo takes up the last part of the bathroom. A very typical bathroom setup! I am doing a mix of metals in this bathroom. The faucet and shower fixtures are going to be chrome. 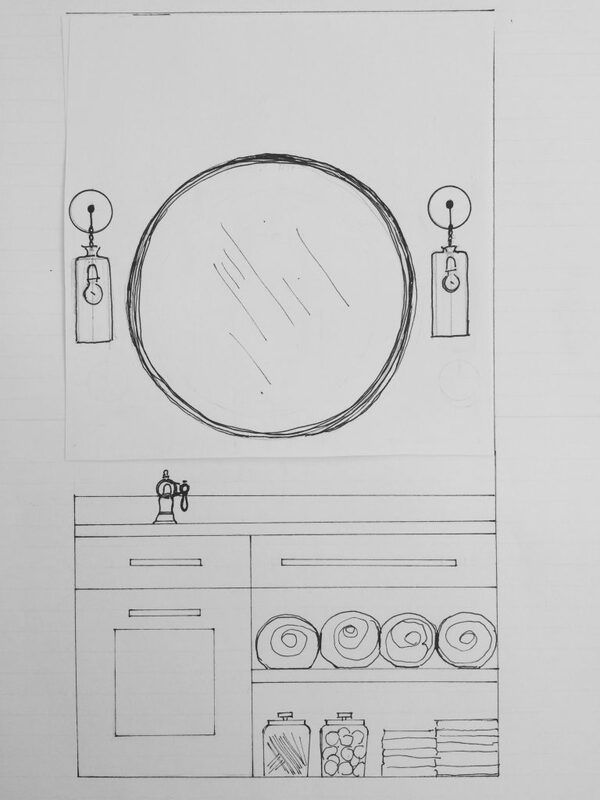 The mirror has a silver rim, but to give the eye relief from all the “silver”, my light fixtures are going to be bronze. Why the switch to chrome? I’ll let you in a budget-friendly design trick: going with a chrome finish on plumbing fixtures will save you hundreds of dollars for the same faucet/shower system. Don’t worry about being so matchy-matchy. You’ll notice I went with one sink again instead of two. I wanted the countertop space more than the sink. I have a teenager, after all. She’s not into makeup yet, but we’ll see how long that lasts. I also plan on giving the kids a mirror in each of their rooms so that some of their “getting ready for school” can be done privately. This will take the load off of 3 kids sharing one bathroom. This bathroom fell more onto the traditional side, but I pulled it back into a transitional area with long bar handles and some open shelving. 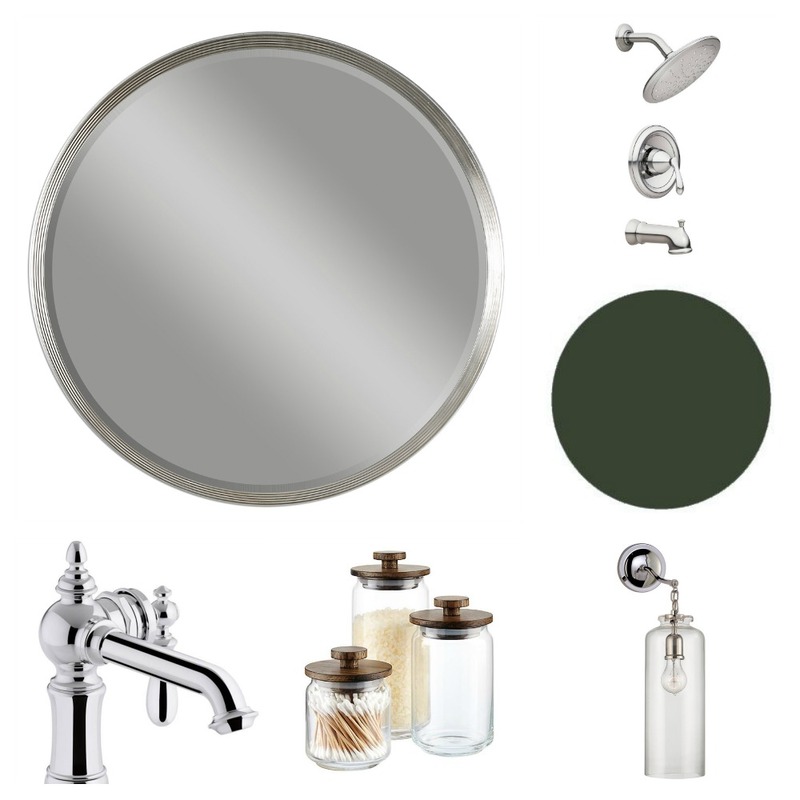 The faucet (from Kohler) is a beautiful mix of traditional/modern/vintage. And you know how I’ve been obsessed with Farrow and Ball’s “Studio Green”? I’m using it again in this bathroom, only this time it will be the color of the vanity. Walls are white, and countertop will be white as well. I don’t know what material the countertops are yet. Either it will be left over from buying slabs for our master bathroom shower, or I will hunt a remnant down at the granite supplier. (Another $ saving tip: “remnants” are leftovers from other jobs, and suppliers want to get rid of them. Go hunt something down in their “boneyards”. I’ve found some expensive stone this way and bought it for a fraction of its original price). I may throw some touches of natural wood in this bathroom. That’s why I loved those clear containers (from the Container Store). I may put some faux beams on the ceiling as well….we’ll see. If I do, they will be sleek, not rustic. The shower curtain will be custom, and I haven’t figured out the fabric for it yet. Stay tuned. The shower is a tub combo acrylic. You may turn your nose up at it, but it’s very affordable and kid-proof. I will still pick one of those over a custom tiled shower because I hate cleaning grout so much. No shame here! That’s my kids’ bathroom tour. Thank you for stopping by. Next week I’m going to get into more architectural details. We’ll be discussing doors, knobs, and windows. You’ll get to see our exterior elevations, as well as our interior door details. I’m pretty darn excited about them! Please come and visit again.